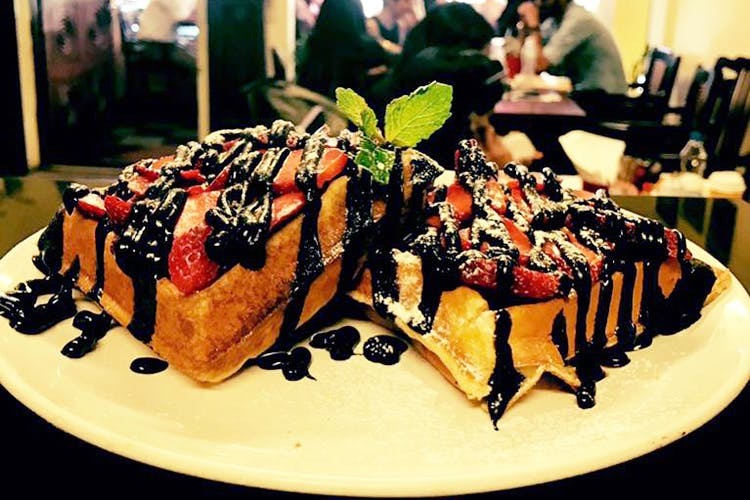 You haven’t had breakfast in Koramangala if you haven’t had the waffles, pancakes, and the breakfast platters from this all-day breakfast cafe. Hole In The Wall is where your lazy Sunday morning breakfast needs to happen. Cosy and comfortable, the place has a very warm and welcoming ambience. Take your book and go if you have some reading to catch up on because even if you are sitting inside or in the al fresco seating, you’ve some sort of privacy. Oh, and during evenings, the place looks absolutely gorgeous with the fairy lights on and peeking through the planters. Where to start. The menu is vast. But if you are going for breakfast then you could start with anything as simple as pancakes with maple syrup to the Funky Monkey Waffles that come loaded with bananas choco chips, chocolate sauce, and condensed milk. You could also try the breakfast combos such as The All English Breakfast and The Chicken Hole 9 Yards Hash. Personally, I’d go for the Kiddie Waffles with sprinkles, ice cream, and choco chip waffles. I frequent this place and its sister place A Hole Lotta Love on JNC Road in Koramangala for breakfast or after college to grab a bite. And every single time the experience’s been good. Oh, and it’s also one of the places I got to when I’m craving for waffles. Their waffles are to die for. Service is a bit slow, and not only when there's a crowd. They do have minimal staff and even when there are not too many people, it's quite tough to get quick service. You need to go in a bit early during weekends if you want to get yourself a table for breakfast. The place gets super crowded by 10 am.